A cute all time classic. 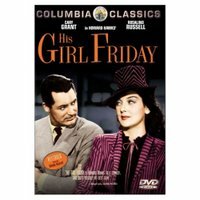 Rosalind Russell stars as Hildy Johnson, a former reporter. 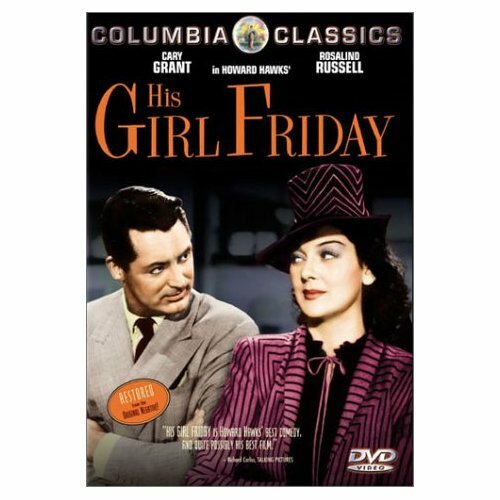 She is engaged to Bruce Baldwin and there is only one problem - her ex-husband Walter Burns (Cary Grant). Walter thinks that Hildy is coming back to reunite with him and is startled when she gives him the news that she is marrying someone else. That is when Walter hatches a plan to get Hildy back. It seems that a man named Earl Williams is scheduled to be hung for killing a police officer and Walter wants Hildy to interview him. He convinces her to interview Williams by saying he will buy an insurance policy from Bruce. The usual craziness ensues with Bruce being arrested, his mother being kidnapped by one of Walter's henchman and a daring jail break by Williams. Now will Walter be able to win Hildy over and steal her from Bruce or will she chose to be a real woman? This movie was very entertaining. Some of the press room scenes can be hard to follow because there is some much going on but it is easy to get past. Russell, Grant and Bellamy are all on the top of their game. There are some snappy lines in this film as well. My favorite is at the beginning when Hildy is telling Walter about her engagement. She says "Oh I love you Walter, I just wish you weren't such a stinker". There are several versions of this movie. The original, The Front Page, was made in 1931. There was also a version of The Front Page made for TV in 1948 and another in 1974 that changed Hildy to a man - Jack Lemon. Finally there was Switching Channels in 1988 starring Kathleen Turner and Burt Reynolds. However, this is a wonderful version for all classic movie buffs.